A bit of paint can be a game changer. Take a look at the recent changes to 400 East, between Center Street and 300 South. Top: Neighborhood residents were concerned about potential traffic issues on their wide street, particularly due to a lighted intersection will be added on 300 South next year. Bottom: city engineers transformed the street yesterday almost entirely with paint. Bike lanes, cross walks, zebra stopping, school zone notices, and still room for parking. Room for all road users. You might notice that 200 E. looks a little different on Saturday, June 6th. 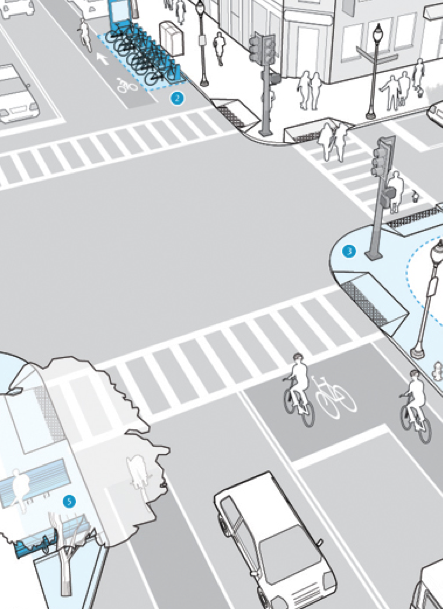 This is a part of a neighborhood project to model a complete street – a shared community space for everyone. That means making the street friendly and safe for neighborhood residents, pedestrians, bicyclists, drivers, and anyone else that might be using the streets. Tactical Urbanism Requires a Good Imagination! Keep in mind that what you’re seeing is just a mock-up of how permanent street changes might look. See beyond temporary items like chalk lines and cones to imagine how the space could look in the future. Neighborhood Greenways, also known as Complete Streets, are designed to enable safe access for everyone, including pedestrians, bicyclists, motorists and transit riders of all ages and abilities. Neighborhood Greenways make it easy to cross the street; walk to campus; and bicycle to downtown, the new temple, and the Frontrunner Station. Curb extensions, sometimes referred to as bulbouts, increase the overall visibility of pedestrians by aligning them with the parking lane and reducing crossing distances. They also serve as a visual cue to drivers that they are entering a neighborhood street or area. Parklets are converted curbside parking spaces that create vibrant community spaces. 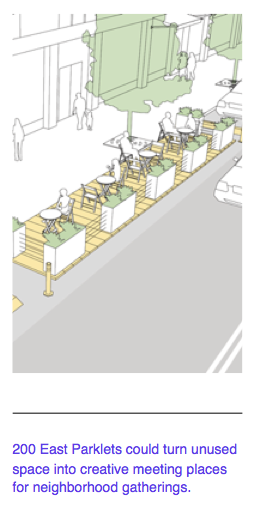 Parklets incorporate seating, greenery, and accommodate unmet demand for usable public space. Shared Lane Markings or “sharrows” are markings used to indicate a shared lane environment for bicycles and automobiles. 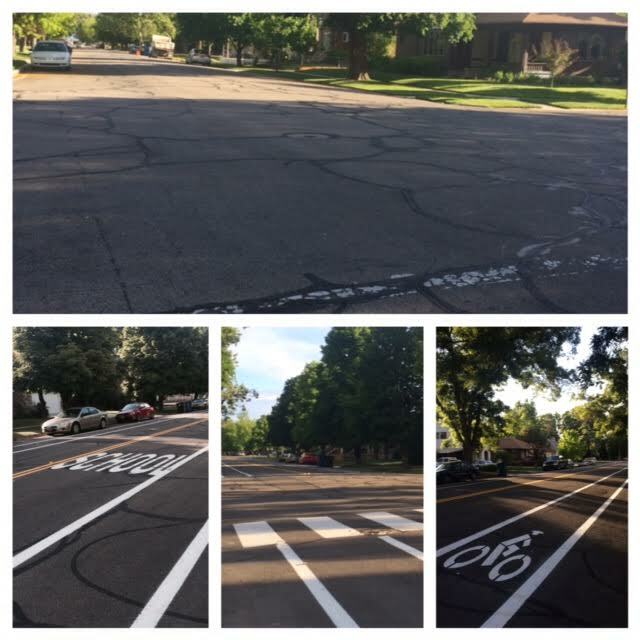 Among other benefits, shared lane markings reinforce the legitimacy of bicycle traffic on the street and recommend proper bicyclist street positioning. Bring your imagination to the Neighborhood Greenway Party and imagine the future of safer, more people-friendly Provo streets. There will be live entertainment, food trucks, a scavenger hunt, and a chance to win lots of awesome prizes (including pieces from local artists and Disneyland tickets)! See you there! All month long, Provo residents, employees, and students recorded their daily/weekly miles ridden on nationalbikechallenge.org. 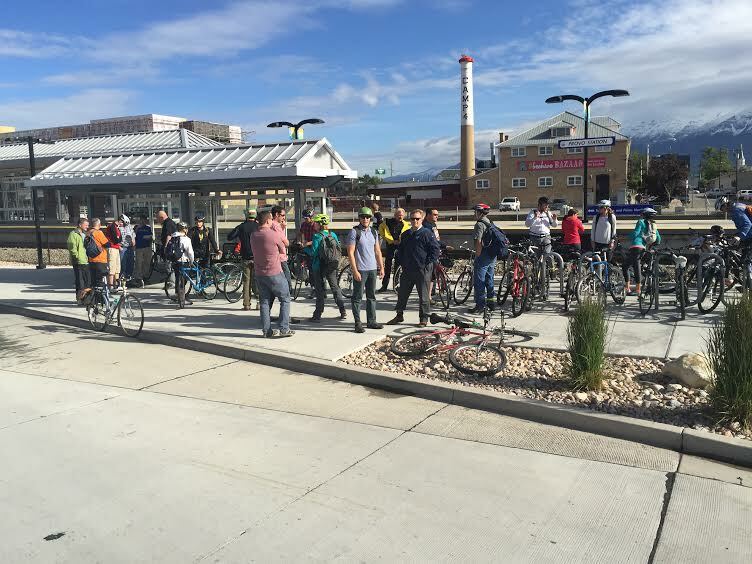 Because of everyone’s commitment and determination to get out and ride their bikes during the month of May (whether for recreation or transportation) Provo City was ranked 8th on the National Leader Board! We rode a total of 17,546 miles, burned 951,090 calories, and saved 7,793 lbs of Co2 in the month of May. Go Provo! Read more on Mayor Curtis’ blog.